I couldn't believe my ears when I called the AZ Game & Fish and found out that I had been drawn for the Kaibab deer hunt (12A-West Early Season). I had gotten lucky ... again ... my third time drawn in the last four years (Let me know if you want your applications blessed next year, although most likely, I've used up all my luck.). They say that the third time is a charm and it was true in my case. Although I didn't get a monster Kaibab buck, I got a respectable one this time. The first time I was drawn in the Kaibab (1995, 12A-West early season) I did not have much luck. My hunting partner Rick's wife was pregnant and due during the hunt so he couldn't leave with me. I took the family along for the first weekend of the hunt and they had a good time camping/hunting with me. They packed up on Sunday and I was on my own. Due to the lack of a second vehicle (I had a cabover camper on a pickup) I mostly hunted on foot around my camp. I hunted several days and had only seen one buck, a forkhorn, and several herds of does. It was starting to snow and I was off the highway about five miles in a two wheel drive vehicle. I was starting to get worried and decided to pack up camp on Wednesday and move to another location closer to the main road. While I was moving camp I gave Rick a call, from Jacob Lake Lodge, and found out that they had a baby boy and he would come up on Friday to hunt with me. I awoke the next day to about a foot of snow. This was my sixth day hunting and I was getting more and more discouraged and tired from hiking several miles a day around camp. I was supposed to be in the best mule deer territory in the country and had only seen one buck so far. About mid-morning Friday, I finally saw another small forkhorn, in a small canyon, and since I didn't have any meat in the freezer I decided to take him. I aimed my trusty .243 and dropped him. He was down in a canyon and I had to cut him up to pack him out. Talk about work. I went to the lodge to meet Rick about 3:00 PM and saw several nice bucks while waiting. I talked to several of the hunters and found out that they had their successes in the lower country off the plateau. I tucked that information into the back of my memory just in case I was ever drawn here again. Rick showed up late in the afternoon and we went out to where I had gotten my buck. I had seen another forkhorn on one of my trips packing out my deer. We found the other buck and Rick got him. Hunt over ... not what I expected from a Kaibab hunt, but the information I gathered would prove useful in the next few years. Post hunt: While checking out at the G&F check station around 25 bucks had been taken with 25 inch or larger spreads (from both the 12A-W and 12A-E areas). G&F takes a picture of the big ones and posts them on the wall. Very nice bucks to say the least. Can you believe the luck? 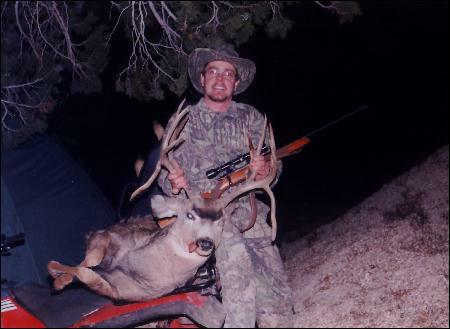 Drawn again in 1996 for the Kaibab late season hunt (12A-West, only 150 tags available). It had snowed about two feet in the early .Kaibab season, melted some, and when Rick and I arrived in the late season it was snowing again. We arrived late so we pulled into the campground across from Jacob Lake Lodge to spend the night. In the morning we would head to a spot where we had seen a couple of big bucks, including a Kaibab monster, during the archery season in September. 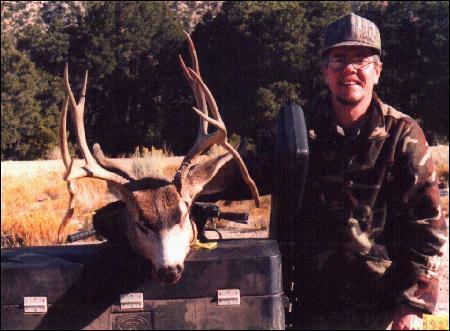 I had read a small book on the migration patterns of the Kaibab deer during off-season, so I was not confident in hunting where we had seen the big bucks (we hunted on top of the plateau during archery season). Morning arrived to about a foot more snow. We packed up and headed to the spot where Rick had left his tree stand. We arrived, not to our surprise, to find the road impassable with the motorhome. We took the jeep in to retrieve the tree stand and had snow hitting the bumper most of the way. Not a fun trip. We didn't see any tracks on the way in. We parked about a mile in and hiked in another ¾ mile to get the stand. Needless to say we packed it up and got the heck out of there. From the information that we had gathered from our previous rifle hunt, and the book, we decided to camp below the plateau and hunt the piñons and scrub oaks. The 1996 hunt would prove to be a very fun hunt. We saw from 40 to 60 head of deer a day, including 6 to 8 bucks a day. I was passing on bucks I never thought I would have. Nice 4x4's and 3x3's (Usually one to two a day). We also saw a lot of forkhorned bucks. On the first day of the season we were hunting some rough country and spotted a nice 4x4. Not heavy antlers but about 24-28 inch spread and about 12-15 inches above the ears. We debated whether to take him and I finally decided to take a shot. I was still debating with myself when I let drive ... Boom ... a clean miss. Up and over the ridge he went. In retrospect I should have taken that buck more serious, but at the time it was the first day of the infamous late season Kaibab hunt. About the third day into the season Rick had seen a Kaibab monster on a meadow during sunset at about 800 to 1000 yards. We would call this buck 'Granddad'. We set up on the meadow again the next day. Again towards evening Rick saw Granddad, this time at about 600 yards. Still no shot. We went back the next morning (Tuesday) and pushed the ridges beside the meadow. Several minutes into the hunt I heard Rick shoot. He killed a nice 3x0. That's right, it only had one antler and a nice one at that. Rick saw it running through the trees, and that it had a tall rack (not knowing it had one antler at the time), and returned his eyes to the kill zone. With the excitement of seeing Granddad in the area last night, he didn't want to take the chance that it would get away. When it cleared an opening he let drive, without checking its antlers again. One deer down and one to go. Rick was disgusted with himself since he had passed on nicer bucks in days past, but that's the breaks. After about six days into the season we saw fewer and fewer nice bucks due to the hunting pressure. I still wanted to hunt the big one, but settled for a forkhorn on the second to the last day of the season. We never did see Granddad again. At least I would take home some meat and had a very enjoyable hunt. Post hunt: While checking out at the G&F check station around 20 bucks had been taken with 25 inch or larger spreads in the early hunt and about 13 had been taken in the late hunt, for a total of about 33 (from both the 12A-W and 12A-E areas), as of when we checked out on Saturday. Again some very nice bucks. Kaibab Hunt 1998 12A-West Early Season ... That's right, the third time in four years. I know what you're thinking and I agree ... what a lucky S.O.B. Day 1: Saturday, October 31st: Rick and I headed out to one of the productive meadows from two years ago and walked some ridges. We saw two small herds of does on our way in along the road so again it appeared promising. We were unsure of hunting below the plateau, especially since it had not snowed yet this year, but it appeared the deer had started to migrate. After an unsuccessful walk we decided to eat a snack and sat down about 10:00 am. We had been sitting about 15 minutes when a doe and two fawns passed by us at about 30 yards. We were well hidden and she finally winded us and moved off. About 10 minutes later a small herd passed by us that had a little forkhorn in the group. Our first buck sighting. He passed us at about 20 yards. Where's a shot like that when I'm carrying my bow? The rest of the day we spent familiarizing ourselves with the area and the roads. We also saw several small herds during the evening. All in all about 25 head of does and fawns and one buck. Day 2: Sunday, November 1st: Again we saw a couple of small herds on the way in. One herd had two small bucks in it, a spike and a forkhorn. Rick did not feel well and returned to camp about mid morning. I stayed and did some ridge walking. Around 1:00 PM after a small siesta I spotted a herd of about nine does coming towards me across the bottoms. No bucks so I continued my hunt. I arrived back at my ATV around 4:00 PM and decided to watch the meadow in front of me by the main road. I climbed up on a ridge that oversaw the meadow and found a place to sit and watch. I saw three does and continued to watch them. At about 5:15 PM I heard a shot from above me on the side hill, then some hunters talking. Well I figured this place is a bust so I headed back to the ATV, loaded up and headed out. Just as I entered the small meadow, there was a herd in front of me of about a dozen deer and a nice 4x4 to boot. Damn it, that'll teach me to stay put till dark. I quickly shut down the quad and retrieved my rifle from my gun boot, loaded it and headed toward the meadow. Boom ... someone took a shot at the 4x4 as he entered the trees. I didn't hear the patented slap so figured it was a clean miss. I knelt down and watched two small forkhorns come by me along with some of the does, but the 4x4 stayed in the trees. I never saw him again. I talked to the hunter that took the shot and he was excited. He had a better look at the buck then I did and figured it was about a 20 inch spread, albeit not a heavy rack. I packed up again and headed to camp. All in all I saw around 40 head of does and fawns and five bucks that day. Day 3: Monday, November 2nd: Rick felt better so he came hunting with me again. We saw about two dozen does and fawns in the morning and afternoon hunts along with about three small forkhorned bucks. In the evening we decided to set up on some meadows that we found earlier in the day. It actually was the Kanab creek burn area, from several years ago, and the grass was about 2-3 feet tall, great vegetation. I saw a couple herds of does and fawns that evening and Rick was fortunate to see a 4x4 in the herd that came by him. He took about a 250-yard shot and we both heard the patented slap after the shot, but Rick said that the buck did not go down. We looked for a blood trail till dark but did not find any. We figured he missed or hit the tree next to the buck. Rick said the buck was nice but no Kaibab monster. All in all we saw about 35 head of does and fawns and four bucks that day. Day 4: Tuesday, November 3rd: Again throughout the day we saw about 20 head of does/fawns, a couple of forkhorned bucks and a small 4x4. Rick attempted a shot at the small 4x4 at about 250 yards but missed. Being indecisive on a buck costs you more often than not. In the evening we decided to go back to the meadows where Rick had shot at the 4x4 the evening before. I decided to head further west and scan some of the tall grasslands about a mile from the road. 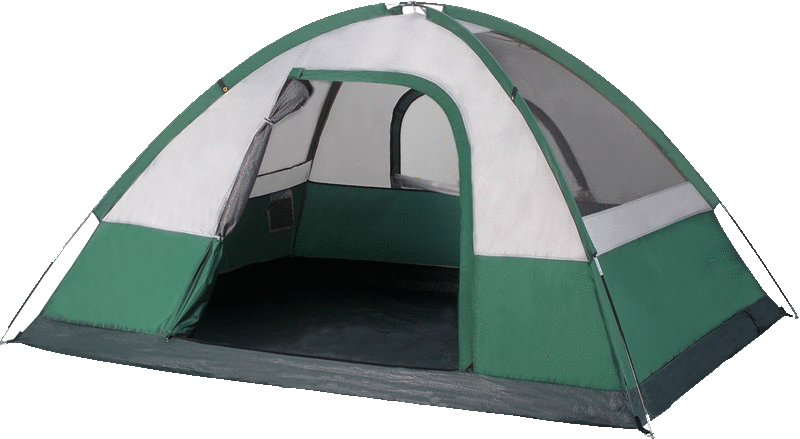 I walked in about ¼ - ½ mile and since it was early in the afternoon (3:00) decided to take a siesta. At about 4:00 I awoke from my afternoon siesta and started glassing. The does and fawns started to come out of the trees and into the grassy ridges. I counted upwards of about 30 head in small herds. Then I spotted a nice 4x4 coming out of the trees with a herd of deer at about 800-1000 yards around 4:30 PM. No Kaibab monster but respectable. I figured he was nice enough to stalk and get a closer look. I didn't have a tri-pod for my variable binoculars and couldn't steady myself well enough at the higher powers to get a good look at him. I started my stalk trying to be careful so that they would not see me, because it was wide open. I kept myself low and ducked down off the ridge I was on. I climbed the next ridge and when I got towards the top I kept a burned tree between the buck and me. I still stayed low, because being closer, I could tell he was with two other forkhorned bucks and two does. I set up beside the tree and extended the bipod on my .243. I looked through my fixed 4x scope and thought to myself, "Jeez, he's a long way off still." He was pretty small in my scope. I figured he was about 300 yards at this time. (I know what you're thinking, bet he invests in a variable scope next time and maybe a range finder and you would be right). Of course my heart was racing from climbing up the ridge (I had told myself not to get too excited and get the adrenaline flowing because he wasn't a Kaibab monster buck, which to my amazement I was able to do). I sat and watched him for about 5 minutes and at one time when he raised his head I thought I saw a dewdrop on him (I call dewdrops the point of an antler that grows downward instead of up, I am not sure of any other terms for it). It was hard to get a good look at his antlers due to the tall grass and the fact that he kept his head down most of the time grazing. Once I saw the dewdrop I got a little excited and decided to try for him, but knew he was outside my range to take a shot. So I crawled to some trees down the ridge about 50 yards away ... thank God for the tall grass or I am sure I would've been spotted. Well I set up again and laid in the prone position to get a shot. He still looked small in the scope but I figured I was about 225-250 yards from him. I looked around and thought I could gain about 75 more yards, but felt I surely would be seen by one of the deer, so I took aim but could not steady myself due to having to lift my torso off the ground about 6 inches. I have one of the older style bipods that only has two positions, one for lying down and one for sitting. Since I was on an incline I used the fully extended position to get me above the grass, but it was slightly too tall then. Lucky for me there was a flat rock in front of me about 3 feet so I crawled to it and rested my elbows on it. I waited for him to turn broadside; currently he was slowly working away from me about 50 yards from the top of the ridge. Please, God, make him turn before he gets over the ridge, I thought. After a couple minutes, which seemed like hours, he did turn broadside. I put the cross hairs towards the top of his shoulder. I knew from practice that my gun was shooting about 4 inches low at 250 yards. I had zeroed it at 100 yards expecting to be hunting in the pines. I steadied myself, and squeezed the trigger ... Boom ... nothing ... clean miss ... ?!#$%@. I quickly reloaded and kept an eye on him in the scope. He only took a few steps and was alert. I said to myself, "He must be further away than you think." I am terrible, I'll admit, at judging distances. So I held about 5-6 inches above his shoulder, steadied and squeezed ... Boom ... He dropped his head a little.... he's hit. He started staggering towards me and I returned my attention to his antlers ... jeez he does have dewdrops and he really looks nice, not a heavy Kaibab monster, but better than I thought he was, a 5x5. Of course then I was really excited and jacked another shell in. I took another shot ... it was a clean miss. I said to myself, "Let him go he's hit hard and not going anywhere." He walked about 30 more yards and fell over dead. I gave him about 10 minutes and hiked over to him. The bullet entered his rib cage right behind the shoulder, clipped a lung, liver, and exited out mid body below the spine (he was above me and at a slight angle towards me). When I got him gutted, it was getting dark and I was about a mile from the ATV so I started hoofing it. While trying to find Rick I ran into two herds of deer of about a dozen each. One herd had a little 3x3 with it. I found Rick and we went back in to retrieve my buck. Rick was impressed and congratulated me. We were about 15 miles from camp, it was a long cold ride back, but it was worth it. All in all, on the day we saw around 65 to 75 head of deer including about six bucks. Day 5: Wednesday, November 4th: On this day, Rick didn't find anything he wanted to shoot, but believe it or not we saw around 120 head of deer that day including about five bucks, mostly forkhorns and one 3x3. Rick passed on the 3x3 in the morning, but wished he hadn't as the day wore on. On the way back to camp Rick said he was getting a little tired from the hunt, especially the long ATV rides from/to camp in 30 degree weather. He decided he had had enough and was going to take anything tomorrow. Day 6: Thursday, November 5th: Of course once you decide to take anything with antlers then you don't see them. We hunted for a couple of hours in the morning and saw about a dozen deer, none with antlers. We then headed back to the spot where I got mine and found several herds of deer still on the grassy meadows. We found a nice forkhorn. Without much fanfare, Rick killed it and we packed it up and headed to camp. We arrived at camp by about noon and decided to stay the night to let the deer bleed out after skinning. Day 7: Friday, November 6th: Clean up camp and check out day. Let's go see how some of the other hunters had faired so far. We had seen several forkhorns taken and a few 4x4's throughout the week. It is always fun to go to the checkout station and see the pictures of the big bucks taken. Ahead of us was a hunter who took a nice 4X4 with about a 25-inch spread and a medium heavy rack. I pulled out my buck for the G&F to measure. The widest points on the rack were actually the dewdrops, which measured 23 inches of spread. Wow! Nicer than I thought, but didn't meet the 25-inch minimum required for the wall of pictures. The officers said that this was the first buck they saw this year with dewdrops. One officer disappeared into the office while the other took down license information. I noticed on the tally board that only thirteen bucks had been taken so far (from both 12A-W and 12A-E areas) with 25 inch or better spreads and of those, most were medium heavy antlered, only one or two were really heavy. Down from the prior years I was here. Also around 290 yearlings had been taken so far, with about 60 three to seven year olds (mostly 3x3's and 4x4's I assume). That's a lot of bucks. Next, to my surprise, the officer came out of the office with his Polaroid camera. I was going to make the infamous wall of fame (as I call it). I looked at Rick and he had a smile from ear to ear. I can just imagine that my smile was the same if not bigger.